Fridays at All Seasons have an energy all their own. The smell of fresh popcorn at in the morning is ubiquitous. The Spring and Autumn Rooms take turns making it, which always draws a crowd of excited children. They count down waiting for the first pop, help melt the butter or add salt, and simply enjoy watching the steam rise. Making five large bowls could easily become a chore, but somehow it never does. At 11:00, teachers call out, “Walleyes and Eagles, it’s time for movies and popcorn with the Grandmas and Grandpas!” Children from both preschool rooms gather and head upstairs to visit Memory Cove West (Walleyes) or Memory Cove East (Eagles). Anticipation builds before we open the Cove doors, as children are asked to think of what they might say to the seniors. 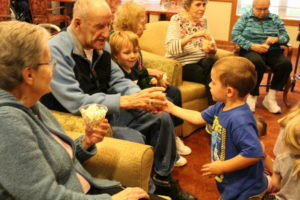 They are challenged to not forget anyone, shake each grandparent’s hand, make eye contact, and verbally greet everyone. 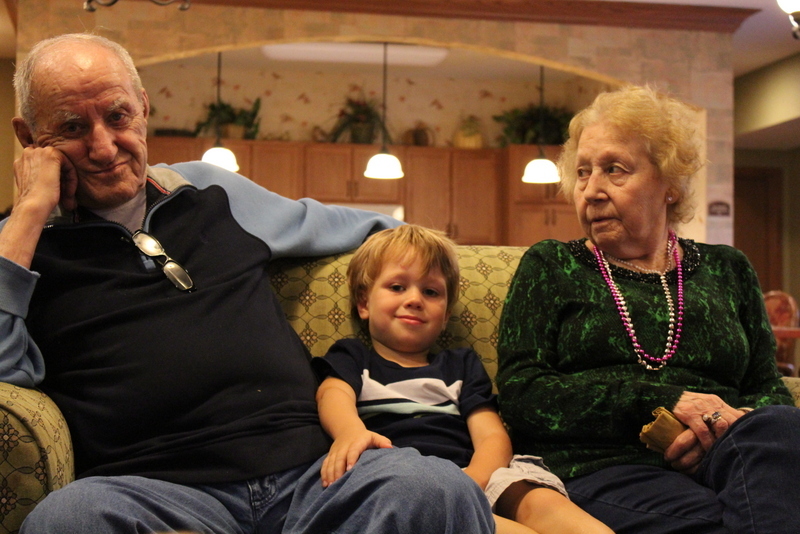 As names are learned, there isn’t much sweeter than listening to children call out, “Good Morning, Grandma Ruth!” or “I like your sweater, Grandpa Bob.” The smiles they receive in return can be breath-taking. Next up is popcorn distribution, with the children hand delivering a cupful to each senior. When Grandma Mary declines, they know to move on to Grandpa Greg. After double-checking to see if all the seniors have what they need, then, and only then is it time for the children to receive theirs. After gathering at the feet of Grandmas and Grandpas or getting the “lucky” spots on the couch between doting seniors, the movie begins. Finding movies that appeal to both generations is an ongoing pursuit. We look for the ones which evoke long-ago memories for the seniors; watching with their own children or grandchildren. And the ones that are still appealing and appropriate for today’s children. Many movies have failed or were rejected for a variety of reasons. Old animated cartoons include jokes rooted in racism or sexism. Classic movies like Swiss Family Robinson demean females’ potential, and many have scenes too frightening for children such as the ‘child snatcher’ in Chitty Chitty Bang Bang. Some are simply too slow-moving or over the heads of preschoolers (vintage Lassie or Singing in the Rain). We have skipped scary sections, explained gender equity over the TV volume, translated British accents, and fast-forwarded to the musical numbers when yawns were apparent. Thankfully, there have been successful finds. Mary Poppins is returned to year after year and has the added benefit of songs to connect the generations. 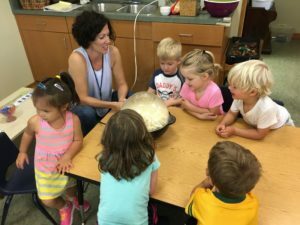 The music becomes a part of community sing-a-longs and the catchy lyrics are requested time and again when we sing with the Grandmas and Grandpas. Milo and Otis, Winnie the Pooh, and episodes of Mister Rogers have also been well received. While the challenge of finding good fits can take up multiple staff meetings, we continue to search because those twenty minutes a week of comfy, cozy, casual time, without an agenda are what we are after – being at home with each other.